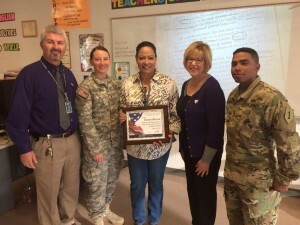 Eunice Rivera (center), teacher and veteran, was one of four MHS teachers presented with an Education Salute award. From left: Manhattan High principal Greg Hoyt, First Lt. Jessica Deason, Tonnie Martinez and First Lt. Anthony Magallanes, presented the awards. The College of Education’s Office of Innovation and Inspiration found an innovative way to thank area teachers for their military service by surprising them with an Education Salute award during class. The teachers who received the awards on Sept. 30 were Manhattan High School’s Ed Chandler, David Jordan, Pat McKinney and Eunice Rivera. Tonnie Martinez, assistant professor and coordinator of the Office of Innovation and Inspiration, developed the ongoing program as a means to demonstrate the wealth of knowledge many teachers bring to the classroom. Martinez invited two officers from the Big Red One to help present the awards. They were First Lt. Anthony Magallanes and First Lt. Jessica Deason. “A lot of the students in the classes looked like they had no idea that their teachers even served,” Deason said. According to Martinez, that was exactly the point.